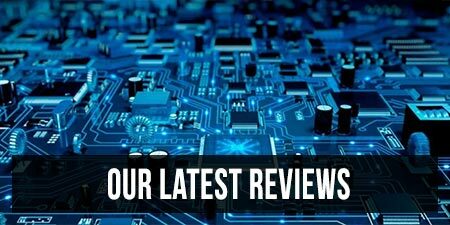 It is our wholly unbiased opinion here at UltrabookReview that Ultrabooks are great. 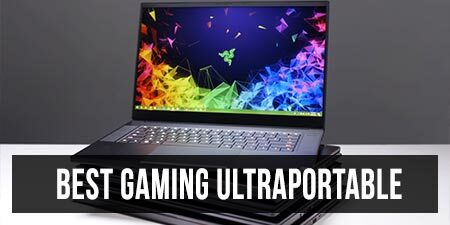 Once you get used to the portability, convenience, and styling afforded by one, it is very difficult to go back to something bulkier such as a hulking ASUS ROG G-series laptop – even if it comes with a massive increase in processing power. 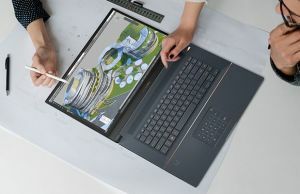 Just because you prefer a thin-and-light machine doesn’t mean you don’t also want to do some video editing, 3D rendering, CAD, or of course, gaming on the go, however. Enter the 14-inch Razer Blade and Gigabyte P34W. Yes, there are smaller Ultrabooks with decent power out there, such as the 13.3-inch ASUS UX303LB, but its NVIDIA 940m is barely sufficient for today’s games and will leave more demanding users wanting in 3D performance. The 15.6-inch MSI GS60 is indeed thin and light, but it also has quite the footprint. 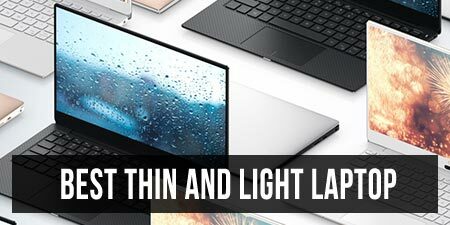 When it comes to extremely powerful thin-and-light machines under 15-inches with top-tier graphics, there are very few options on the market. 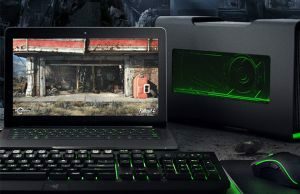 For most people, it will come down to the 14-inch Gigabyte P34W v3 or 2015 Razer Blade. As one of the few people financially irresponsible enough to own both machines, I have put them through their paces for you, dear reader. Read on to find out if either of these two 14-inch ultraportable powerhouses manage to provide both ultraportability and raw power, and which one is the right one for you. Update: A review of the updated Razer Blade 2016 is also available on the site, in case you’re interested. Price Available here on Amazon as reviewed, or here without the SSD Available here on Amazon as reviewed. Price starts at $2199 with 128GB storage for this configuration. The P34Wv3 leads in I/O and expansion. As you can see, both these notebooks use the same CPU (i7-4720HQ) and GPU (NVIDIA 970m GTX) and have similar weights and dimensions. The key differences between the machines are design language, build quality, ports/connectivity, storage, screen, and of course, price: The Razer Blade costs anywhere between $500 to nearly $1000 more than the P34Wv3. If just comparing specs and price, it’s easy to pick out a winner: The P34W v3 gives you objectively more of almost everything (unless we’re talking pixels or style) for a lower price. While the Blade does have that beautiful QHD+ IGZO display, it has only 3 USB ports (compared to 4 on the P34), no VGA, no SD slot, and a rather ridiculous storage limitation of only have a single m.2 bay. For the time being, that means the absolute maximum on-board storage you can get is 512GB. If it really was just about specs and price, though, certain *ahem* companies wouldn’t still be in business and everyone would be carrying around Clevos. With that being said, let’s take a look at the build quality and styling of these machines. The Razer’s unibody aluminium case is minimalist, sleek, and smooth. Very few manufacturers have this high quality of construction, and Razer stands with Apple at the top. The casing is rigid and feels 100% solid with no flex, despite being slightly thinner than the Gigabyte. There is a slight blemish on the Blade’s otherwise flawless construction: the screen hinge and WiFi antenna wires are covered with a black plastic cover, and for whatever reason, this causes the display to occasionally make noise when it’s adjusted. If you run your finger across the hinge when applying pressure, you can hear a few pops and crackles as the plastic cover shifts. I have checked with other owners and this does not seem to be a one-off defect; it seems to affect most Blades. I suspect this may have to do with the rear exhaust vents blowing extremely hot air onto the hinge causing warping of the material over time. It isn’t a huge deal, but it isn’t something that should found on a machine that costs up to $2700, either. The P34 v3’s case is made from both matte aluminium and polycarbonate. The majority of it is aluminium, but the bottom casing and bezel are polycarbonate. The casing snaps together and is tightened into place with screws. Because of this, there is some slight flex of the casing if you try to twist it with both hands. This has also lead to some owners complaining of unevenly constructed chassis which don’t sit flat right out of the factory. However, it seems that taking off the bottom cover and tightening it up evenly generally fixes these issues. Unfortunately, a substantial amount of other owners have been have reported receiving laptops with worse issues, such as aggressively bent trackpad buttons. My model has no such defects, but that they are not infrequent is disheartening to hear. Hopefully, Gigabyte will tighten up their production standards as they seek to expand their notebook market share. Overall, the P34W still feels like a quality machine, but little compares to the unibody aluminium construction of the Blade. Note regarding both machines: the black aluminium surfaces are fingerprint and oil magnets. Trying to keep either machine smudge-free is a fool’s errand—If you’ve got an obsessive compulsion to clean, consider yourself warned. The Blades uni-body aluminium chassis and green accent lighting give it a distinctive personality. The Blade is certainly the more attractive and well-designed notebook here, but it’s neon-green keyboard and emblem lights are not for all people nor all environments. With black-on-dark-gray tones all around, the P34 is best described as drab—yet this is not necessarily always a negative, as professionals in very conservative work environments will likely feel much more comfortable with its relatively bland design. 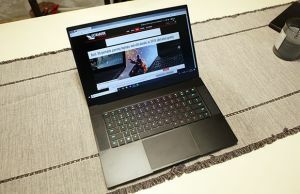 The Razer is an attractive laptop and it does look mostly professional (think black MacBook Pro but with a glowing green Razer logo). Still, if you had to pick one to take with you into a board meeting, it would definitely be the Gigabyte. This is not an indictment of the Blade’s design, but glowing neon is not going to be everyone’s cup of tea. Which design is better for you is a matter of both personal taste and workplace needs. The Blade’s design is beautiful and ever so slightly ostentatious, inviting looks and comments. The P34 will go completely under the radar. The Razer’s green logo is even more conspicuous when the machine is on. The Blade’s IGZO QHD+ display (3200 x 1800) is excellent. According to notebookcheck’s measurements of both laptops, the Blade’s QHD+ display is objectively superior to the P34W’s 1080p matte display in terms of brightness (318 vs 305 nits), contrast (765 vs. 424), color accuracy (delta of 3.67 vs. 2.81), and even power consumption (IGZO displays have a lower power draw than IPS at similar resolutions). However, the Blade’s QHD+ display is glossy, and having a touch display adds weight, power consumption, and price to the equation. Glossy screens are naturally difficult to use outdoors compared to matte, though you can purchase a matte screen protector to help ameliorate the problem. There is also the issue of DPI scaling (although this is a software problem rather than an issue of the hardware). The Blade requires a DPI scaling of at least 200% to be usable at native resolution at the desktop. Most apps are fine, but some are fuzzy and others are broken and don’t scale at all. To be clear, though, this is the fault of poor programming/neglect (I’m looking at you, Apple) and not the display. Scaling is better than ever in Windows 10 and hopefully the remaining niggles will be ironed out before too long. Finally, 3200 x 1800 is useless for serious gaming. The NVIDIA GTX 970M can power through games at 1080p, but attempting to play at the native resolution reduces performance too much to be worthwhile. Still, scaling at 1080 or 900p looks nearly as good and is a viable solution. This is the main advantage of the 1080p screen on the P34W: you can run everything at the native resolution without performance problems and DPI scaling incompatibilities are less of an issue. On the Blade, you might need a pair of binoculars handy to use the iTunes toolbar. If you need touch, high color-accuracy, or work with extremely high resolution images/video, then the QHD+ Razer Blade is the clear winner. If you don’t, though, the P34W’s display is no slouch and will do fine. Note: the Blade is also available with a matte, non-touch 1080p screen when ordered directly from Razer. The Gigabytes’s display might not be 3K, but it’s still well above average. 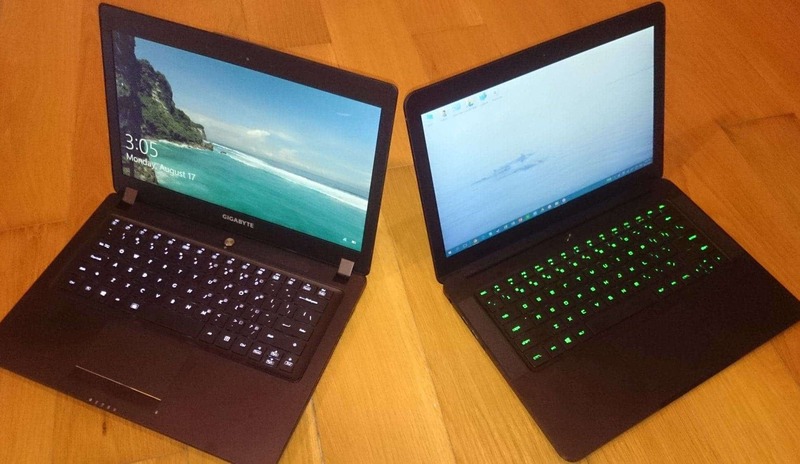 Both the Blade and the P34W have similar keyboard layouts. There are no macro or dedicated hardware keys on either machine. Both keyboards feel good to type on with sufficient resistance and travel. I would give the Blade the edge due to some slight flex of the keyboard tray on the P34 as well as the Blade’s keystroke being a little more crisp and solid. The trackpad on the Gigabyte’s Elan touchpad is slightly smaller than the Blade’s, but with a larger button. Notice that I say “button” and not “buttons”, because the P34W uses a single piece of aluminium for the clicker. It is depressible on the left and right, but attempting to press near the middle (as most people will be used to doing) results in nothing. The action is solid and satisfying when clicked, but the fact that it does not function when clicked near the centre is very frustrating. After two months, I still find myself missing clicks occasionally. The Blade’s Synaptics spacious touchpad is highly configurable, and the options to designate “smart zones” and adjust the area where touches are registered is very helpful, especially for people who type with their wrists down. The material used has excellent glide, and overall, the touchpad is the best I’ve used on a PC notebook. It is refreshing to see a PC manufacturer take touch input seriously instead of as an afterthought. The one weakness of the Blade’s input is the trackpad button material. The clickers are somewhat thin and made from plastic, resulting in unsatisfying feedback that borders on feeling and sounding cheap. If they had used metal instead, it would be faultless. This is such an issue with both of these laptops that it deserves its own section in this comparison, ahead of performance. Both of these laptops have a similar dual-fan cooling design and the same powerful components with the same TDP. Firstly, both of these laptops will throttle out of the box when both GPU and CPU are taxed. The P34W will throttle much sooner (within minutes if not seconds) and the Blade will throttle later, but the bottom line is that the heat produced by the components exceed the abilities of these machines’ active cooling systems. As the CPU and GPU are identical on these laptops, in both cases it’s the CPU which is responsible for the excessive heat. The core i7 4720HQ will hit temperatures of above 95C when operating at turbo frequencies under load while the GPU will be relatively cool. The result is that heat pipes of the cooling mechanism are pushed to their capacity by the CPU to the point where they affect the GPU’s temperatures, despite having dual-fan cooling solutions in both machines. There is no simply getting around the fact that the 4720HQ is a hot chip placed in a very thin chassis with both these laptops. Here’s where things get complicated when comparing the machines: The Blade runs at cooler CPU/GPU core temperatures than the P34W, meaning it’s capable of sustaining higher performance and runs at safer (for the components) temperatures. You might think that this means the Blade outer case is cooler than the P34W, but this all depends on what you mean by “cooler”. Idling or doing light tasks, both machines are relatively cool and heat is not an issue. Under medium–high load, the Blade is internally cooler than the P34W, yet due to the aluminium case, relatively high trigger-point for the fans, and location of the main exhaust, the area around the power button gets warm—and then hot—extremely quickly. The palm rests and keyboard get warm, but never outright uncomfortable. Stray too far near the back of the chassis during rendering or a gaming session, though, and it is painfully hot. How hot? Around 50-55C near the power button. Given the external temperatures under load, you can forget about using the Blade on your lap when under heavy load. The Gigabyte, on the other hand, does a better job of controlling external temperatures despite its higher internal ones. The rear near the power button still gets toasty (~45C) but it doesn’t feel like your finger is burning when you touch it like on the Blade. This is likely due to the difference in construction materials: aluminium does a much better job of transferring heat than plastic. As a result, despite the CPU and GPU of the P34 nearing the temperatures of a dying star under load, it never feels as burning hot as the blade does near the rear. I still wouldn’t recommend running stress tests on your lap, but it’s more comfortable to the touch than the Blade. The bottom line is that the Razer Blade does a better job of managing the heat of its components. With turbo disabled, limiting the CPU to 2.6Ghz (and I’ll talk more about enthusiast tweaks for both these machines later), the CPU will level off around 80C and you shouldn’t run into any problems with throttling. The P34, though, will still reach alarmingly high CPU core temperatures even with turbo disabled when pushed—but you won’t feel the heat as much. With the combined power of the i7 4720HQ and NVIDIA 970M GTX GPU, both laptops are blazingly fast. The Gigabyte P34Wv3 scores in the 8700-8800 range in 3DMark11, with CPU temps peaking at a blistering 95C. Subsequent runs cause the score to drop down to 8500 or below as a result of thermal throttling. Games show a similar trend, where framerates drop 10-15% after the first few minutes as the GPU and CPU run below their rated speeds to keep temperatures down. It’s unfortunate that the cooling solution isn’t sufficient for the components in the P34 to run at their fully rated speed. The good news is that the P34 is still plenty powerful, even with throttling, to run almost anything you throw at it. The GPU is the bottleneck for 3d performance in most cases, so by lowering the CPU clocks manually (see my recommendations section further down) the laptop can achieve more consistent performance. The Razer Blade scores 9200 in 3DMark11 with CPU temps peaking at 94C. Given the same CPU and GPU in both machines, this shows that the P34 hits its temperature ceiling very quickly and then throttles, whereas the Blade can run at full speeds for the whole benchmark. *measured with Android app “Sound Meter” by placing phone next to the exhausts. Gigabyte set to “auto-high fan”. The Blade wins this round due to its (albeit slightly) higher performance with lower internal temps. Because of the Blade’s width, it is able to have upward-facing speakers on either side of the keyboard. The speakers are decent, able to fill a room with sufficient volume and also provide a fair amount of bass. While you won’t be throwing out your 5.1 surround sound system upon hearing them, they’re certainly above the thin-and-light average. The P34’s speakers don’t fare nearly as well, unfortunately. They are tiny and downward-facing, producing tinny sound which needs to be at 75% volume or above to even be noticed above background noise. 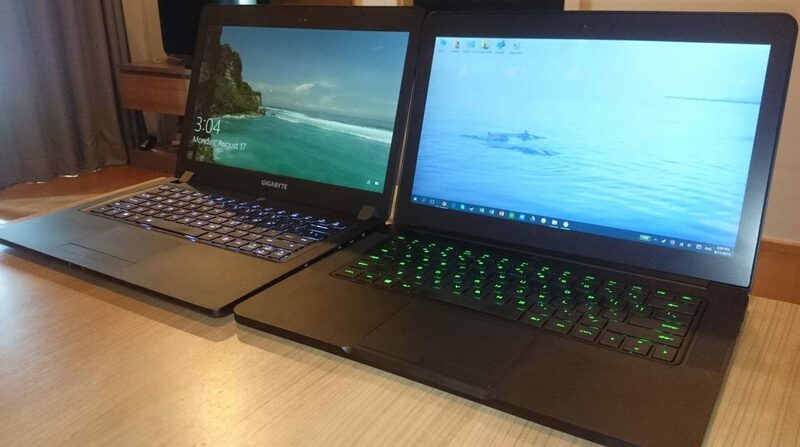 The Razer Blade is the clear winner here. Although the Blade has a larger battery than the P34 (71 Wh vs 61.25 Wh), it doesn’t seem to last quite as long. Having used both these laptops for a few weeks with both laptops set to the same balanced power profile, the Blade tends to run down after a little over 4-4.5 hours of browsing/word processing using Wi-Fi. In comparison, the P34 often surpasses the 5-5.5 hour mark, despite its smaller battery. I suspect this has to do with the touch-functionality of the (extremely high resolution) IGZO display, which, although consumes less power pixel-for-pixel than traditional IPS displays, also has nearly three times as many pixels to power in addition to a touch sensor. Note: Owners of the FHD (1080p) model of the 2015 Blade report 5-6 hours of casual use. Though neither laptop is a slouch when compared to the paltry battery life on most thin gaming laptops such as the GS60, the P34W wins this round with nearly 1 hour more run-time than the Blade. There are a few things regarding each machine that don’t quite fit into any of the regular categories. It should be noted that Gigabyte gives the owner more control over their product. Firstly, opening the Blade to upgrade or replace a part will void your warranty. Period. This is quite ridiculous, and it is counter to the policies of almost all other OEMs. A $2700 piece of technology should not have its warranty voided by routine maintenance. The P34 comes with Gigabyte’s Smart Manager software, which allows control over fan speeds with “stealth”, “auto-low”, “auto-high”, and “max fan”. There is no way to control the fan speeds of the Blade, which is a shame given that it’s temperature thresholds are rather high, meaning the fans tend to ramp up and down with turbo on. A smaller touch, but a nice one nonetheless, is the P34’s light sensor, which can be used to automatically enable/disable the keyboard backlighting. It can be hard to get your hands on a Razer Blade if you live outside the few countries Razer ships to. The QHD+ Blade ranges from $2200-2700 upwards from the Razer Store (plus shipping and customs). It’s also available on Amazon and a few other webstores. The Gigabyte P34W v3 (as reviewed) sells for around $1650 at the time of this post, and you can check out the latest prices at the you’re reading the article here. It should be noted that the newer iteration, the v4, has recently become available. It’s only major difference is the i7 5700HQ processor instead of the i7 4720HQ, which is slightly more power efficient. This means that the v3 is likely to get cheaper as the v4 replaces it with most retailers. While it’s nearly impossible to get the Blade shipped to a country outside of their coverage even by third party sellers, the P34W has no shipping restrictions placed on it. 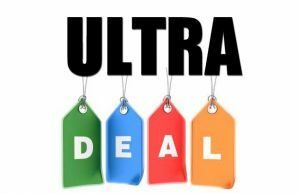 The fact that it will require some tricks to acquire a Blade in many countries in addition to the $1000 premium (compounded by import taxes) it carries can make the decision between the two easy. First, get familiar with ThrottleStop. You will need to use this to control the temperatures of the CPU automatically. I would recommend using it to disable turbo (limiting the CPU to 2.6ghz) as well as setting up a temperature-triggered profile at 90C set at a lower multiplier, such as x20 or x22. This will prevent the CPU from heating up to the point where the GPU (the bottleneck) downclocks, keeping performance more consistent. Consider undervolting. This can be done with either ThrottleStop or Intel’s XTU. This is a relatively easy way to lower temperatures; just make sure you do it slowly and benchmark after each drop in voltage to ensure the system is stable. Most owners report that -50mv is a safe place to start. If you go for the P34, repaste the CPU and GPU with something better than the stock thermal paste, like IC7. This will help manage the temperatures better. If you opt for the Blade do not repaste it. Doing so will void your warranty and the Blade has a very peculiar direct-heat-pipe cooling system with a specific kind of paste used. If you aren’t technologically inclined to fiddle about and don’t care to learn, then simply go to Windows Power Options and set the max CPU speed to 99%, thus disabling turbo. This is the easiest and most effective tweak you can do to manage the heat on either laptop. 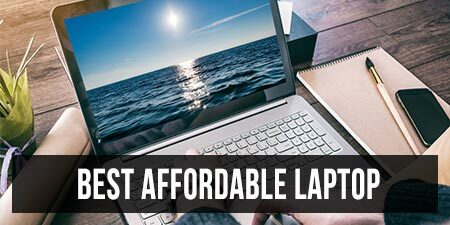 However, frankly, if you aren’t the type who wants to fine-tune their system, then it’s likely that neither of these laptops are for you—you might prefer a more mainstream solution. Know what you are getting yourself into: These are machines designed for enthusiasts and they’re a bit like wild horses or supercars. Don’t expect either of these laptops to run cool and quiet when unleashed. If you aren’t comfortable with a bit of noise and heat, look elsewhere. Advantages of the Gigabyte P34W v3: More I/O with 1 more USB 3.0 ports, an SD slot, and VGA port. Both mSATA and 2.5” drive bays. Opening the machine does not void warranty. Gigabyte smart manager allows more control over hardware. Lower surface temperatures make it more comfortable to use under load. Advantages of the Razer Blade: Better handling of internal temperatures, less throttling. Better design and materials. Gorgeous QHD+ touch display. Solid unibody case. Best trackpad I’ve ever seen on a Windows notebook. The Razer Blade is a superbly well put-together piece of kit. 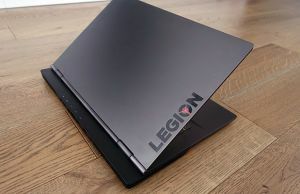 That so much performance can be fit into such a stylish and high-quality package means that for those looking for the best thin-and-light gaming notebook that money can buy should look no further than the 2015 Blade. Those looking for the most bang-for-their-buck or working in conservative environments will definitely want to consider the P34W v3. It doesn’t look as sharp, throttles more, has a poorer trackpad, and the chassis isn’t as solid, but it will handle everything you throw at it without screaming “Look at me, I’m a gaming laptop!”. The extra $1000 you saved could certainly assuage any leftover inclinations you have towards the Blade as well. In summary, if money is tight, the P34 is a no-brainer. If you need the best of the best, then get the Blade, and you will not be disappointed. Got questions about the Blade or the P34? Tried both and have a different opinion? Post away in the comments section. What about P34W 950M version? Looking at performance data from notebookcheck, the 970M is downlocking to 950M performances/speed anyway. Is there a point with going for 970M version – eg. better power efficiency, being able to extract more power by following your recommendations? Is it possible to get even more performance from GPU, or get same performance from GPU at more sane noise levels (~35dBa instead of insane 50dBa) if we throttle CPU more aggressively (I’m not sure if there are any modern games that would be CPU bound)? Is it possible to lower the noise/heat by using dedicated laptop dock/stand? What is your opinion on actually owning a very expensive laptop that runs its components so close to or even at thermal limit? Aren’t you afraid that it will die within a year or two due to thermal stress and brutal on/off cycles (20 to nearly 100C and back)? First, the 970m is absolutely worth it. It around twice the speed of the 950. And remember, even with lower clocks, the 970 has way more CUDA cores than the 950. This is something core clocks can’t change. You can definitely downclock the CPU to keep the gpu performing well (and even overclocking the gpu), and in fact I’d recommend it. The lifespan is certainly an issue with a laptop like this. I think that gigabyte’s 2 year warranty really helps with that issue, though. Even if the components fail, you can get it repaired for free. For two years. Most people don’t even own a laptop that long, anyway. I would recommend keeping cpu temps below 90 and gpu below 85. I think that realistically you’ll be fine for the lifespan of the laptop at those temps. what would be your opinions about P505 (heavuer, 15inch laptop, but according to notebookcheck with excellent noise performance) and C405 (actual competition)? I do have one question remaining – what about the noise? Is there a way I can deal with that via underclocking/undervolting or using active cooling laptop stand? I’m not sure about it because I’ve never used it. Personally, I think it’s too big and chunky for me. You can eliminate the noise on the Razer Blade with turning off turbo. As you can see in the chart, this keeps it nearly silent, or around 35db by the fans. It will only rev up if you’re in a very hot climate without AC. With the P34 you’d have to use “low” or stealth fan profiles. These will make the laptop nearly silent as well, but they will reduce performance a substantial amount in order to compensate for less cooling. If you want a computer to use for a long time, like 5 years, my honest opinion is to wait for USB C 3.1 notebooks. In late 2015/early 2016 we’re expecting external USB C graphics solutions, so if you get a usb C laptop you should be able to keep upgrading the graphics externally. These gaming laptops aren’t going to be able to keep running the new titles in a couple years, and the batteries aren’t going to last either. Great Article, loved the detail and very well presented. I have the P34W V3 is awesome, but very very warm, I change the paste for a coollaboratory liquid ultra is -7 C now but still warm. the other problem is no displayport, so no 144hz or 120hz. I try to underclock my razer blade with intel XTU to 3.2 Ghz but I get blue screen time to time. Are you sure you’ve limited the turbo and nothing else? It sounds like you’re maybe undervolted too much. What is the BSOD code? I don’t use XTU because it’s very finicky, I’d recommend you use Throttlestop 8 beta 3 instead. You can set temperature profiles and undervolt with it and I find it’s more reliable. I try different value and if I lower the freq I get blue screen sooner. The problem with Throttlestop is after resetting the laptop I should open it again. Is there any solution to this? By the way I see this problem after I upgrade my laptop to win 10. Also what do you recommamd after 1 year for heatsink pasting it should be dead until then and you don’t recommend to repaste it. So without the changes, it doesn’t BSOD at all? I can’t think of why that would be– look up the error given on the BSOD. It might be unrelated. Make throttlestop a startup task with task scheduler so it’s always open/on. I have only gotten BSODs as a result of undervolting too much. I found that core/cache below -56mv causes BSODs under load. As for the thermal paste: I highly recommend sending it in for service to get repasted. If you don’t, though, then don’t use any of the traditional “good” pastes like IC7. I repasted mine (no warranty anyway) many times using different methods and pastes– the only thing that worked was a special TIM designed for direct-heat contact sinks. Not sure if you’re researched it, but the RB doesn’t have a heat-plate over the CPU, instead it has direct contact with the heat pipes. This means that the practice of using less paste will actually result in much worse performance instead of better. I’ve talked with Razer techs about this and while they couldn’t tell me anything specific, they hinted that a TIM specifically for direct-heat contact pipes (known as HDT) was close to what they use. They also told me that given the temps I reported to them, I was basically getting as good performance at stock as they do with their special paste. So, in short: find a paste specifically designed for HDT coolers, not MX-4 or IC. Clean the old residue off as best you can and reapply liberally on the CPU die and the HDT. You should be able to run XTU bench and peak around 88-89C with turbo enabled. Now if I run bench in xtu I got 93 to 98C. :( I think its time to repaste it. It seems it related to driver. Do you know how to lower the fan temp threshold from 90 to 80? If you have any link to buy HDT type paste please let Mr know. That sounds like it’s unrelated to changing the clocks. You should probably take your memory dumb to a tech support to pinpoint the driver. There is no way to change the fan ramp thresholds, unfortunately. Could you please tell the brand of pasting you use for your Razer? I mean the HDT type. If you aren’t comfortable repasting, I would recommend just sending it in. Taking it apart voids your warranty, and if you slip up, you’ll have an extremely expensive paper-weight. I’m surprised the ethernet port isn’t mentioned as an advantage of the P34W. I have a 300mbps connection and can get about 200 of that over my AC wireless connection but when using a cable I can get the full 300mbps speed. Very useful when using my laptop as a desktop replacement.